Principal Cast : Brad Pitt, Mireille Enos, Fana Makoena, Daniella Kertesz, James Badge Dale, David Morse, Ludi Boeken, Matthew Fox, Fana Mokoena, Peter Capaldi, Abigail Hargrove, Sterling Jerins, Moritz Bleibtreu. Synopsis: A former UN investigator is forced into traveling the world to find answers to a zombie pandemic sweeping the globe. What we think : Decidedly straightforward zombie flick starring Brad Pitt delivers plenty of action, a lot of chills, and a great deal of tension through its totally-re-shot final act, starting with all guns blazing and ending with the simplest of human actions right at the death-knock. World War Z never seems to show any signs of its troubled production, having an effortless believability and sense of occasion to its 2 hour running time; this is a highly entertaining and occasionally shocking film that will make you rethink your decision not to be a Doomsday Prepper. Just making this thing was a war. Sometimes, through adversity, genius is born. Often, though, genius is swamped by adversity, resulting in an end product that is never quite the sum of its glorious, challenging parts. 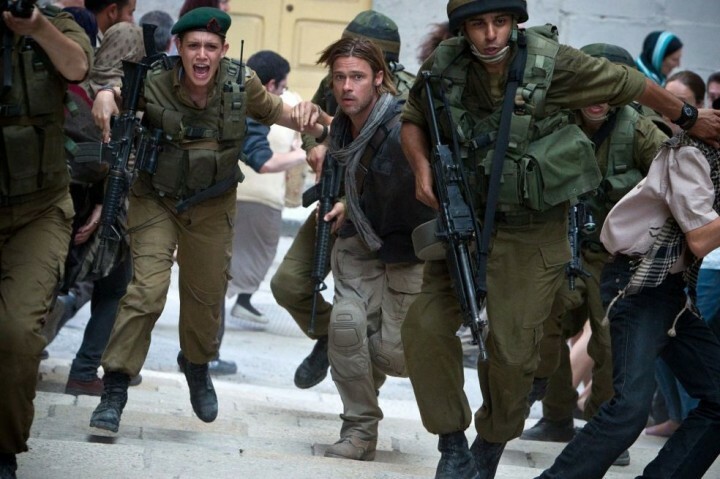 World War Z is a film that was practically breach-birthed into existence, thanks mainly to the persistence of producer and lead actor Brad Pitt, who single-handedly resurrected the potential box-office bomb he was sitting on and turned it into at least a successful film critically, and a major success financially. Poisonous gossip during production, with numerous lengthy and costly re-shoots being demanded by the studio to water the film down to a more palatable mass audience-friendly rating, as well as bitter in-fighting and delays meant the film gradually became better known for not being completed than for being ready to go. The laws of Hollywood would say that a film beset by such difficulties – especially requiring numerous and lengthy re-shoots – indicated the film was in pretty dire shape, and could bomb badly upon release (especially in the cut-throat American summer season), so fans of Max Brooks’ original novel (who themselves were angry at purported changes to the story and characters) waited on this film with baited breath, and razor-blade reviews ready to go. 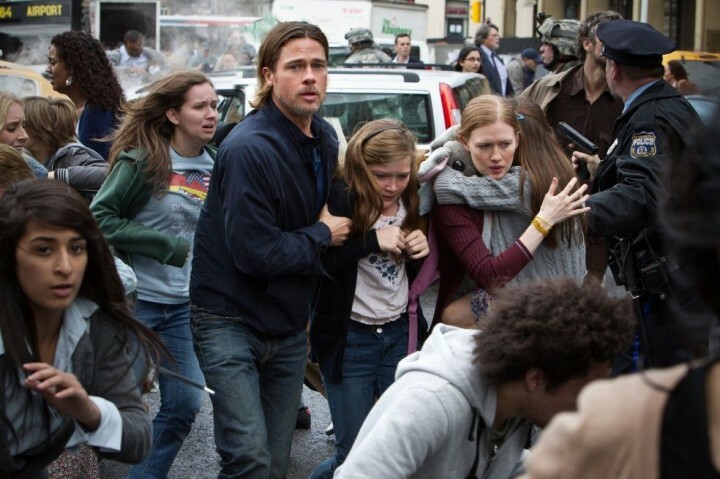 Casual observers just waited to see Brad Pitt leading a crusade against the zombie hordes. 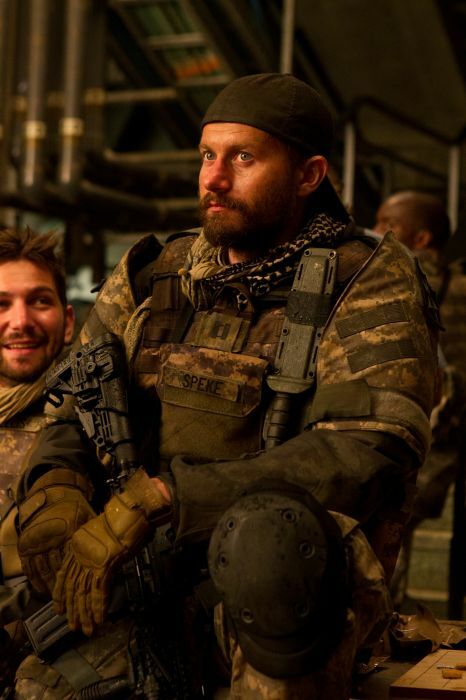 The trailers promised scary, swarming zombies, and only time would tell if director Marc Forster’s efforts would be in vain. I told you we should have taken the subway. Former UN Investigator Gerry Lane (Pitt) and his family – wife Karin (Mireille Enos) and two daughters, Rachel (Abigail Hargrove) and Constance (Sterling Jerins) – are caught up in a global pandemic, as swarms of zombie humans destroy city after city, intent on devouring the world. After a brush with death in the streets of Philadelphia, Gerry and his family are rescued by UN Secretary General Thierry Umutoni (Fana Mokoena), and transported to an off-shore military vessel, where the remnants of the defense network, coupled with surviving scientists and VIP’s have gathered to try and figure out the scale of the pandemic. 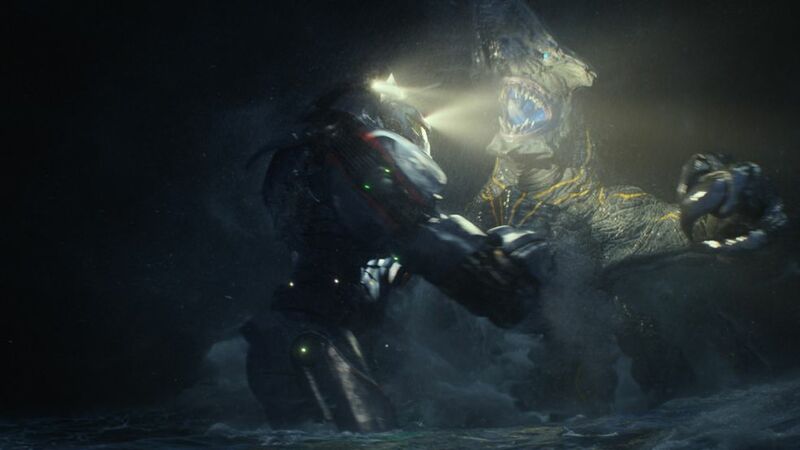 Due to a lack of space on the vessel, Gerry is forced to investigate the outbreak by flying first to South Korea, where a message was sent using the word “zombie”; if he does not, his family will be removed from the ship to free up space for those more able to work to help humanity. After surviving another brush with death in South Korea, Gerry travels to Jerusalem, where the zombie hordes are held at bay by enormous walled fortifications. While gathering intel, the zombies breach the walls, forcing Gerry to flee with young female soldier, Segen (Daniella Kertesz), on a passenger jetliner. Along the way, Gerry remains in contact with his wife via satellite phone, in order to provide her with security knowing he is still alive. Don’t tell anyone I’m here. I’ll give you five bucks! 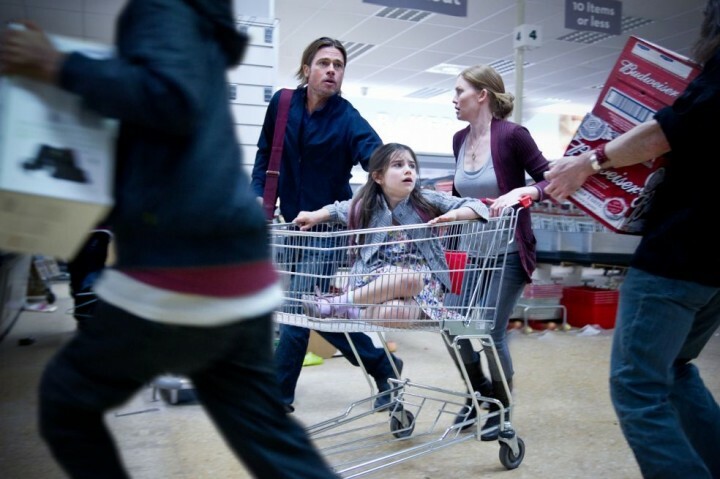 World War Z launches into the zombie attacks with barely five minutes on the clock. The opening salvo, a panicked flight through the riotous, swarming hordes of zombies as they overrun downtown Philadelphia, is instantly frightening and will send your skin crawling off the bone. The second wave, where Gerry and a rapidly diminishing team of soldiers are attacked in the darkness of South Korea, is not quite as taut a sequence as the previous; only when the film lands in Jerusalem, amid the dust and tidal wave of walking dead and the inevitable accounts of human stupidity (people know it’s noise which attracts the zombies, and yet celebrations by survivors are broadcast over loudspeakers, driving the zombies beyond the wall into a lather!) does the film crank up its tension, as the full scale of the pandemic becomes apparent – at least, beyond the nuclear weapons and outgunned military might of the world’s armies. And, in a weird kind of way, World War Z works in reverse to a typical zombie apocalypse flick: the film opens huge, and ends on almost a whisper, as if the “last gasp” climax is to be taken literally. Does it work for the story and the film? Yes, it really does. Look, I don’t know how to tell you this, but we think you’ve slipped into an alternative reality. The screenplay was hammered out by no less than three separate scribes (or four, or five, depending on which source you believe), none of whom probably ever met although they’re lumped together during the opening credits: Mathew Michael Carnahan (who wrote the original screenplay based on Max Brooks’ novel, to be tinkered with by Prometheus scribe Damon Lindelof momentarily, before being re-written and amended by Cabin In The Woods director Drew Goddard. I’m not sure if it was by design or happy accident (apparently the last quarter of the film was vastly re-shot) that the film’s trajectory slowly ratchets down to a fine laser point, but the end result is a terrifically tense, uncertainly brave, and almost documentary-esque sense of impending death and doom affair, validated by a realism to the zombies themselves that cannot be overstated. 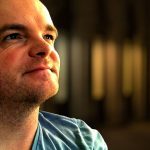 Gerry, as the leading character, does suffer from a little bit of “character shorthand development”, where we don’t get to know much about him other than he’s a Generic Hero with Special Skills (are you reading this, Liam Neeson?) and his dedication to his family is – while admirable – almost nonsensical when he refuses to assist in the investigation ordered by US Navy Captain Mullanero (David Andrews). The script is breathless with its examination of how easily civilization collapses in the face of a global apocalypse such as this zombie plague, restricting typically woe-is-us doomsayers from overplaying their hand, instead delighting in the rapid-fire carnage the swarming, ant-like zombie hordes use to take over a place. It’s less a script and more a join-the-dots solution finder, which might seem a little drama-lite for those seeking something new to the genre. Nah, it’s not that bad. Is it? The cast are uniformly excellent, even in the face of minimal screen time and certain death. Brad Pitt’s Gerry looks like some bearded hippy, until he’s forced to don the Action Man persona and carry this film through its lengthy pursuit and escape sequences, most of which are quite riveting. Pitt’s no Bruce Willis or Jason Statham at all, depicting his character as a well trained Everyman, forced into unique scenarios and to adjust accordingly. Mireilla Enos, as Pitt’s on-screen wife, provides solid if unremarkable support to her husband – she’s the Wife Left Behind in this film, reduced to anxious worry and fear while her Hero Husband is off playing detective. Enos does well, but isn’t given a lot. Daniella Kertesz’s Segen is the perfunctory young female warrior role, with minimal dialogue and seemingly only around to provide an extra pair of hands for Gerry – Kertesz seems out of place in the role, almost too young, which I think was partially the point. Secondary characters, such as Fana Mokoena’s UN council member, and Jerusalem-based Mossad Agent Warmbrunn (Ludi Boeken) are also solid, even if they’re characters designed purely for exposition. 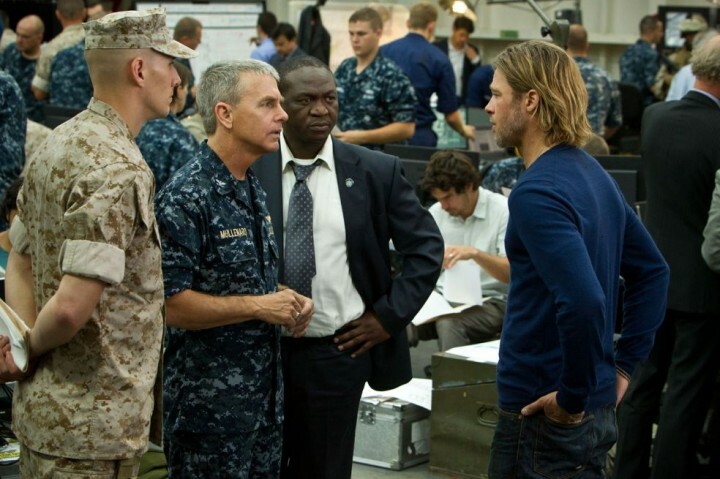 David Morse pops up as a freaky CIA agent in South Korea, while James Badge Dale appears in one of his three 2013 Blockbuster films (Iron Man 3 and The Lone Ranger being the other two) as a been-there-done-that Army Ranger also stationed in South Korea. The film’s third act, set in a Cardiff, England-based World Heath Organization research facility, sees the appearance of the 12th Doctor Who, Peter Capaldi (among others) as a group of scientists who, along with Gerry, find a way to potentially save humanity from extinction. Anybody got the number for a good pest control agent? Marc Forster’s direction on this film is superb; his eye for detail, handling the large scale action sequences and the more intimate, close-quarters elements of the WHO facility’s finale, with equal ease. Forster’s no stranger to blockbusting films, having helmed the vastly underrated Quantum Of Solace in the Bond franchise, and he manages to generate plenty of tension and excitement as the zombie’s swarm. Indeed, they do swarm, hard and fast, delivering the kind of new age zombie we’ve come to love ever since Danny Boyle revolutionized the concept in 28 Days Later (a film which World War Z echoes substantially at times) – these are fast zombies, not the slow, ambling freak-shows which came to be popular with George A Romero’s work. 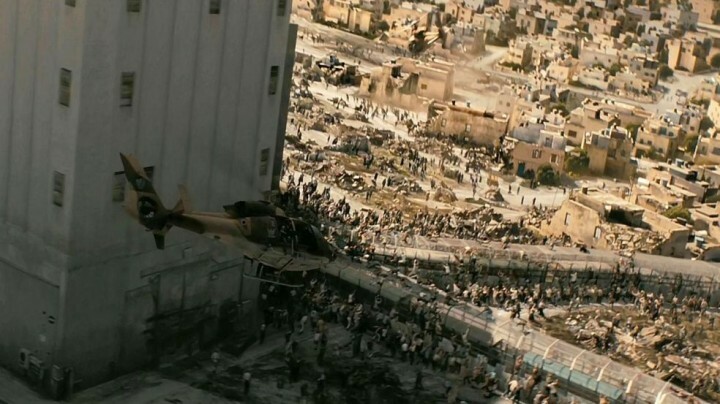 Their swarming over the walls of Jerusalem, through the streets and alleys and buildings of major cities, hurling themselves from heights just to get to living flesh, is creepy as hell, and I think World War Z is as close to reality in this sense as I’d ever like to get. World War Z touches on the fringes of plausibility, as if this kind of thing could potentially happen (maybe not a “zombie virus”, but certainly some other kind of deadly disease) and I think it’s here that the film draws a lot of its power. Thankfully, World War Z never dwells on what-could-be’s, at least not in the sense of trying to make an overt statement about current world security, but it’s a subliminal thing I think, which worms its way in after the fact. Look, we picked a good one! She’s quiet and short, everything we’ve wanted in a child! Now lets get her to the checkout before anyone else notices!! I really enjoyed this film, regardless of its problems or perceived flaws. The action is fast and well mounted, with an immediacy that never lets up once you know there’s a teeth-chattering, super-fast zombie just around the corner, and Brad Pitt’s amiable, charismatic performance drags us through the dull spots with Hollywood Charm. Whenever Gerry’s family are on the screen, the film doesn’t feel as tingly as it should, which is annoying since they provide him with the impetus to do what he does – they’re his driving force, yet the film can’t muster up significant development for these relationships. The scale of the film wanders from truly epic – a lot of the Jerusalem stuff is truly inspired – to intimately terrifying – Gerry’s WHO facility creeping around, trying to avoid making any noise (a fact which annoyed me, because both Clumsy Gerry himself and one of his Clumsy WHO accomplices almost insist on making noise “accidentally” wherever they go, alerting the zombies to their presence!) was particularly tense! – and Forster keeps suspense and terror in fine balance. Get this man to Angelina Jolie!!! Overall, it’s a remarkably entertaining film for a zombie movie, when the zombie movie is taken seriously instead of simply gung-ho with the guns and poor jokes. The film delivers requisite thrills and chills, the occasional gore (most likely CG, though… boo!) and plenty of swarming, water-flooding zombie hordes to chill the blood and send tingles up your spine. World War Z is a terrific apocalyptic adventure, and well worth a look. Merry Christmas from Fernby Films!! Saw it twice this year so that says enough about what I think of it…great flick! Ha ha, you were obviously impressed with it! Not having read the book I don't understand the hate some folks have for it – I thought the film was excellent. You lost me at "lukewarm" QOS – that was a terrific film!! Ha ha!!! I went into this fully expecting to dislike it, but wound up being surprised at how cohesive and un-clusterf@ck-ed it all was. Expected a miasma, got a decent film! Looking back I guess I was most annoyed with how sparingly the film used some of its bigger names – Matthew Fox must have been totally pissed at his role being cut back to being a minor blink-and-miss-it cameo… What say you?